Jihad Watch : My organization, the American Freedom Defense Initiative (AFDI), believed that this public awareness message was critical to national security and should run. 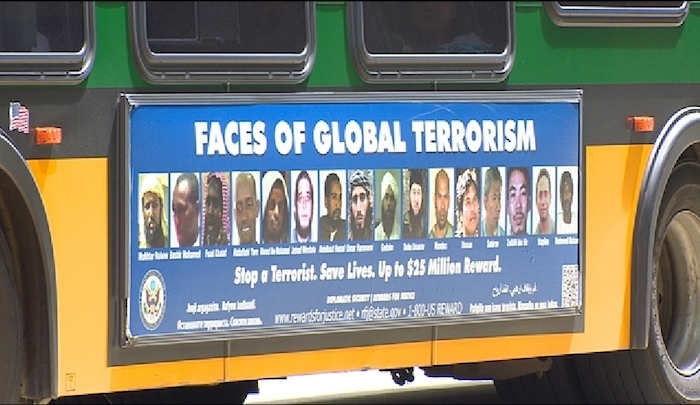 We are constantly being clubbed with the claim that “moderate Muslims” abhor and reject the acts of terrorism that are constantly committed in the name of their religion, so why would they object to a wanted poster featuring Islamic terrorists who supposedly have twisted and hijacked their peaceful religion? Why would “moderate Muslims” provide cover for jihad terror? Why, indeed. Click here to read our entire reply brief in our case against King County. This is a key freedom of speech case, with enormous implications far beyond this one ad. We will never give up in our fight against this flagrant attempt to suppress our most fundamental freedom.